Elves are a magical people of otherworldly grace, living in the world but not entirely part of it. They live in places of ethereal beauty, in the midst of ancient forests or in silvery spires glittering with faerie light, where soft music drifts through the air and gentle fragrances waft on the breeze. Elves love nature and magic, art and artistry, music and poetry, and the good things of the world. Elves can live well over 700 years, giving them a broad perspective on events that might trouble the shorter lived races more deeply. They are more often amused than excited, and more likely to be curious than greedy. They tend to remain aloof and unfazed by petty happenstance. When pursuing a goal, however, whether adventuring on a mission or learning a new skill or art, elves can be focused and relentless. They are slow to make friends and enemies, and even slower to forget them. They reply to petty insults with disdain and to serious insults with vengeance. Like the branches of a young tree, elves are flexible in the face of danger. They trust in diplomacy and compromise to resolve differences before they escalate to violence. They have been known to retreat from intrusions into their woodland homes, confident that they can simply wait the invaders out. But when the need arises, elves reveal a stern martial side, demonstrating skill with sword, bow, and strategy. Most elves dwell in small forest villages hidden among the trees. Elves hunt game, gather food, and grow vegetables, and their skill and magic allow them to support themselves without the need for clearing and plowing land. They are talented artisans, crafting finely worked clothes and art objects. Their contact with outsiders is usually limited, though a few elves make a good living by trading crafted items for metals (which they have no interest in mining). Elves take up adventuring out of wanderlust. Since they are so long-lived, they can enjoy centuries of exploration and discovery. They dislike the pace of human society, which is regimented from day to day but constantly changing over decades, so they find careers that let them travel freely and set their own pace. 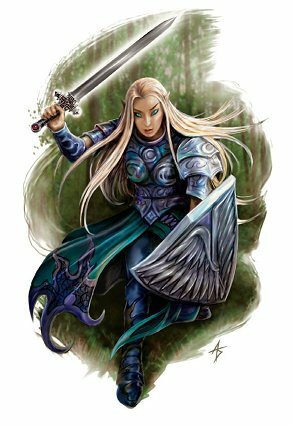 Elves also enjoy exercising their martial prowess or gaining greater magical power, and adventuring allows them to do so. Some might join with rebels fighting against oppression, and others might become champions of moral causes. Although they can be haughty, elves are generally gracious even to those who fall short of their high expectations which is most non-elves. Still, they can find good in just about anyone. Halflings. “Halflings are people of simple pleasures, and that is not a quality to scorn. They’re good folk, they care for each other and tend their gardens, and they have proven themselves tougher than they seem when the need arises." Elves are considered children until they declare themselves adults, some time after the hundredth birthday, and before this period they are called by child names. On declaring adulthood, an elf selects an adult name, although those who knew him or her as a youngster might continue to use the child name. Each elf’s adult name is a unique creation, though it might reflect the names of respected individuals or other family members. Little distinction exists between male names and female names; the groupings here reflect only general tendencies. In addition, every elf bears a family name, typically a combination of other Elvish words. Some elves traveling among humans translate their family names into Common, but others retain the Elvish version. • Age. Although elves reach physical maturity at about the same age as humans, the elven understanding of adulthood goes beyond physical growth to encompass worldly experience. An elf typically claims adulthood and an adult name around the age o f 100 and can live to be 750 years old. • Alignment. Elves love freedom, variety, and self expression, so they lean strongly toward the gentler aspects of chaos. They value and protect others' freedom as well as their own, and they are more often good than not. 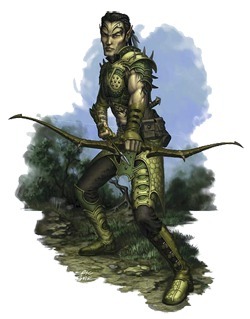 The drow are an exception; their exile into the Underdark has made them vicious and dangerous. Drow are more often evil than not. • Size. 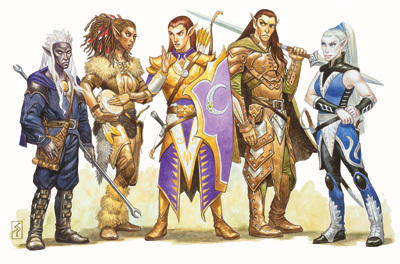 Elves range from under 5 to over 6 feet tall and have slender builds. Your size is Medium. • Speed. Your base walking speed is 30 feet. • Darkvision. Accustomed to twilit forests and the night sky, you have superior vision in dark and dim conditions. You can see in dim light within 60 feet of you as if it were bright light, and in darkness as if it were dim light. You can’t discern color in darkness, only shades of gray. • Elf Weapon Training. You have proficiency with the longsword, shortsword, shortbow, and longbow. • Keen Senses. You have proficiency in the Perception skill. • Fey Ancestry. You have advantage on saving throws against being charmed, and magic can’t put you to sleep. • Trance. Elves don’t need to sleep. Instead, they meditate deeply, remaining semiconscious, for 4 hours a day. (The Common word for such meditation is “trance.”) While meditating, you can dream after a fashion; such dreams are actually mental exercises that have become reflexive through years of practice. After resting in this way, you gain the same benefit that a human does from 8 hours of sleep. • Languages. You can speak, read, and write Common and Elvish. Elvish is fluid, with subtle intonations and intricate grammar. Elven literature is rich and varied, and their songs and poems are famous among other races. 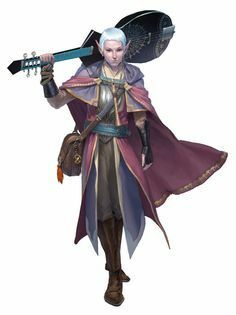 Many bards learn their language so they can add Elvish ballads to their repertoires. 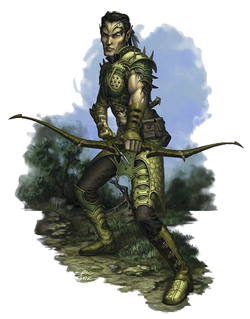 Ancient divides among the elven people resulted into four main subraces: high elves, wood elves, eladrin and dark elves, who are commonly called drow. Choose one of these subraces. The high elf (sun and moon) and wood elf (forest and wild) subraces are divided even further. As a high elf, you have a keen mind and a mastery of at least the basics of magic. High elves are more common and more friendly, and often encountered among humans and other races. Their are two types of high elves the Sun elves and Moon elves. Have bronze skin and hair of copper, black, or golden blond. Their eyes are golden, silver, or black. • Artisan training You have proficiency with one Artisan tool of you choice. Are much paler, with alabaster skin sometimes tinged with blue. They often have hair of silver-white, black, or blue, but various shades of blond, brown, and red are not uncommon. Their eyes are blue or green and flecked with gold. • Musically gifted You have proficiency in one musical instrument of your choice. Both sun and moon elves gain the following traits. Cantrip. You know one cantrip of your choice from the wizard spell list. Intelligence is your spellcasting ability for it. Extra Language. You can speak, read, and write one extra language of your choice. As a wood elf, you have keen senses and intuition, and your fleet feet carry you quickly and stealthily through your native forests. This category includes the Wild elves (grugach) and the Forest elves (Kagonesti). In Living Realms wood elves are reclusive and distrusting of non-elves. Wood elves, sometimes with traces of green. Their hair tends toward browns and blacks, but it is occasionally blond or copper-colored. Their eyes are green, brown, or hazel. Skin tends to be copper in hue. Their hair tends toward browns, but it is occasionally copper-colored. Their eyes are brown or hazel. • Superior Instincts. You can add your proficiency bonus to initiative rolls. Skin has traces of green. Their hair tends toward black, but it is occasionally blond. Their eyes are green or hazel. • Forest Dweller. You can add proficiency bonus to survival and nature checks, that are related to forests. Both wild and forest elves gain the following traits. Fleet of Foot. Your base walking speed increases to 35 feet. Mask of the Wild. You can attempt to hide even when you are only lightly obscured by foliage, heavy rain, falling snow, mist, and other natural phenomena. 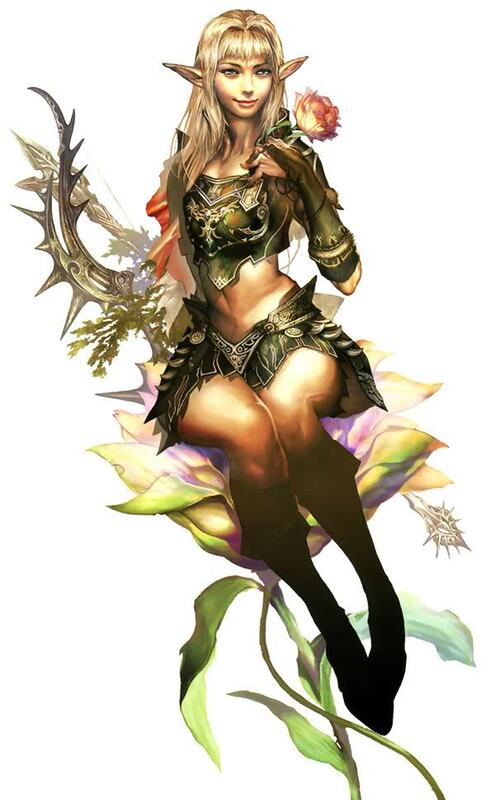 Creatures of magic with strong ties to nature, eladrin live in the twilight realm of the Feywild. Their cities sometimes cross over to the Material Plane, appearing briefly in mountain valleys or deep forest glades before fading back into the Feywild. Fey Step. You can cast the misty step spell once using this trait. You regain the ability to do so when you finish a short or long rest. 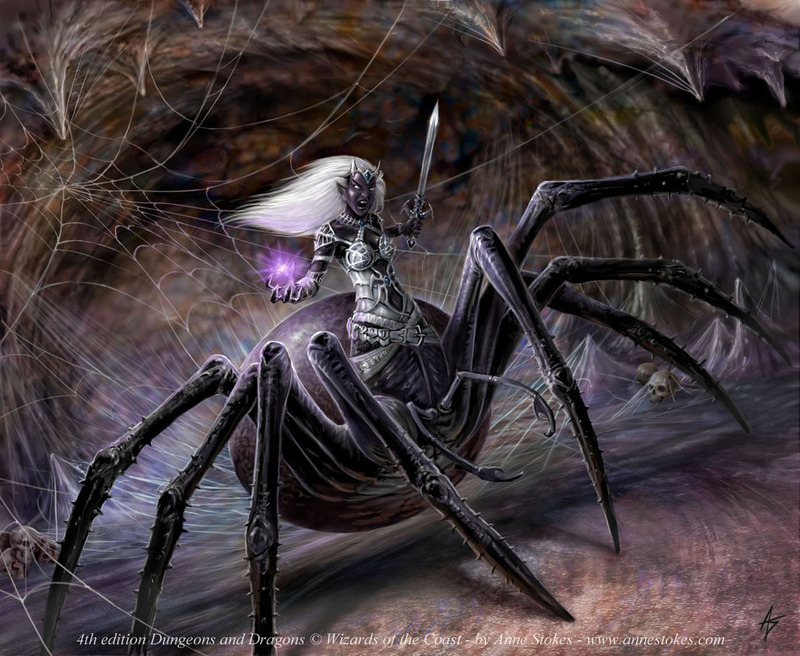 Descended from an earlier subrace of dark-skinned elves, the drow were banished from the surface world for following the goddess Lolth down the path to evil and corruption. 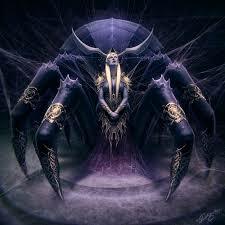 Now they have built their own civilization in the depths of the Underdark, patterned after the Way of Lolth. 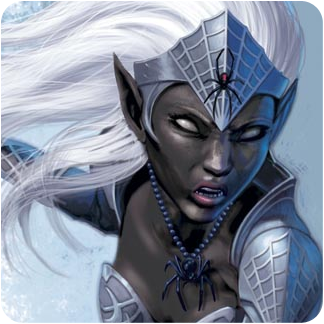 Also called dark elves, the drow have black skin that resembles polished obsidian and stark white or pale yellow hair. They commonly have very pale eyes (so pale as to be mistaken for white) in shades o f lilac, silver, pink, red, and blue. They tend to be smaller and thinner than most elves. Were it not for one renowned exception, the race of drow would be universally reviled. To most, they are a race of demon-worshiping marauders dwelling in the subterranean depths of the Underdark, emerging only on the blackest nights to pillage and slaughter the surface dwellers they despise. Their society is depraved and preoccupied with the favor of Lolth, their spider-goddess, who sanctions murder and the extermination of entire families as noble houses vie for position. Drow grow up believing that surface-dwelling races are inferior, worthless except as slaves. Drow who develop a conscience or find it necessary to cooperate with members of other races find it hard to overcome that prejudice, especially when they are so often on the receiving end of hatred. • Ability Score Increase. Your Charisma score increases by 1. • Superior Darkvision. Your darkvision has a radius of 120 feet. • Sunlight Sensitivity. You have disadvantage on attack rolls and on Wisdom (Perception) checks that rely on sight when you, the target of your attack, or whatever you are trying to perceive is in direct sunlight. • Drow Magic. You know the dancing lights cantrip. When you reach 3rd level, you can cast the faerie fire spell once per day. When you reach 5th level, you can also cast the darkness spell once per day. Charisma is your spellcasting ability for these spells. • Drow Weapon Training. You have proficiency with rapiers, shortswords, and hand crossbows. deep wilds of the world.